When you think of salads, crayfish is perhaps not the first ingredient that springs to mind. Crayfish should not be overlooked however, it's a delicious seafood with a mild but distinctive taste. Crayfish will not overpower the other salad ingredients. A great tasting crayfish salad can be put together without too much effort. It is important to note that if you are preparing the salad in advance it is a good idea to slice the avocados just prior to them being served. This will stop the avocados turning brown. It is also important that the salad dressing is not added to the salad until serving is about to take place. This will help avoid the crayfish being 'cooked' even further by the acidity in the citrus juice. First take the crayfish and poach for approximately 4 minutes in a pan of salted water. After around 4 minutes the shells of the crayfish should have turned an orange colour. 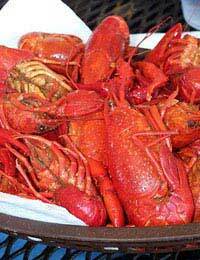 Next you need to remove the crayfish from the hot water and place them in a bowl of cold water. This will help refresh them. Next you need to drain the crayfish and remove the flesh from within the shells. Next take the orange and grapefruit and remove their tops and bottoms with a sharp knife. You then need to remove the peel from the whole fruit before releasing the segments and squeezing the juice from the orange and grapefruit core and collect in a bowl. Once you have done this whisk 4 tablespoons of the juice with the shallot,olive oil,mustard,seasoning and zest from the orange. The avocado should be peeled and stoned before being sliced into pieces of equal size. When this has been done place the avocado in a bowl along with segments from the orange and grapefruit and tails from the crayfish. Once on the plate add salad leaves to the top and add the citrus dressing. It is also possible to use prawns,as a substitute for crayfish, if you prefer and add other ingredients such as corn on the cob (cooked in boiling water), chives, cucumber and coriander. The corn should be cut off the cob in shards and tossed in a bowl with cucumber, chives and coriander with the crayfish added on top, once the salad has been placed on plates. If you are feeling really adventurous you can give your crayfish salad a Thai twist! Once the crayfish has been cooked place it in a bowl and sprinkle salt and pepper over it, along with juice and zest from the lime. Once you have done this place the contents in a fridge for at least 20 minutes. You then need to heat the oil and add the curry paste, as you stir for around 4 minutes before adding the coconut milk and bringing to the boil. After simmering for 4 minutes place in a bowl and allow to cool. Once the contents have become cold add the soured cream, coriander and seasoning. Using boiling water, blanch the corn and sugar snap peas for 3 minutes before draining off all excess water and refreshing by placing them under a cold running tap. Finally toss the vegetables, dressing and red pepper in with the crayfish and place on a dish.